You may remember my friend Yuka, who showed me round the pattern cutting room at her work. 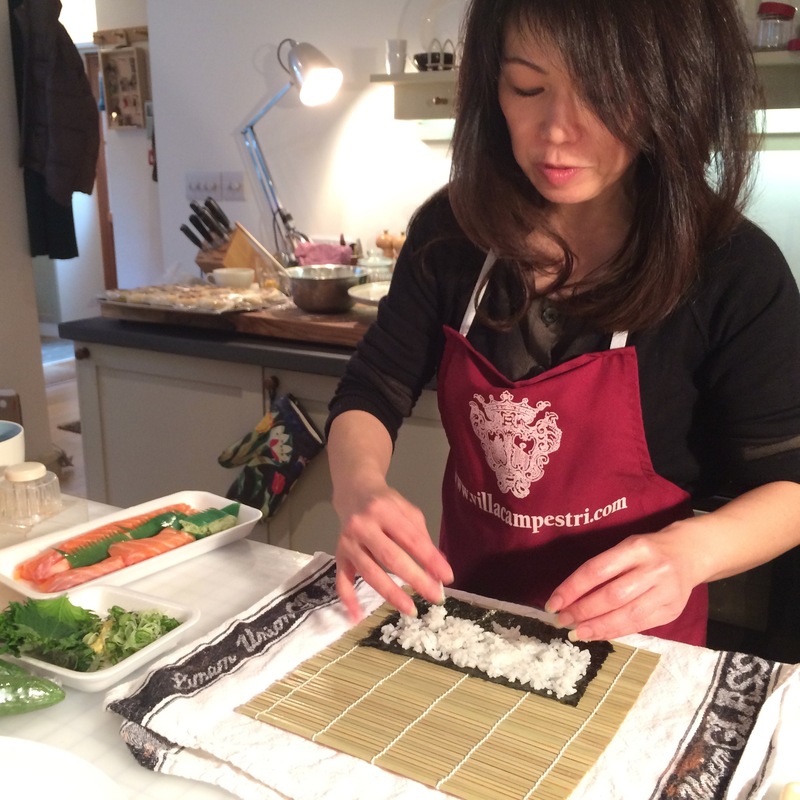 Apart from working in London’s fashion industry Yuka is also a qualified Japanese chef. I know this is a sewing blog, but it was such fun, I just wanted to share the experience. This was a family event no-one wanted to miss so we gathered and waited for Yuka to arrive with some rice she had prepared earlier, lots of raw fish, chicken and fresh vegetables. My friend Meddie came too as she loves Japanese food. The salad contained radish, carrot, raw asparagus, gogi berries, salted peanuts, and some crisp fried pastry. 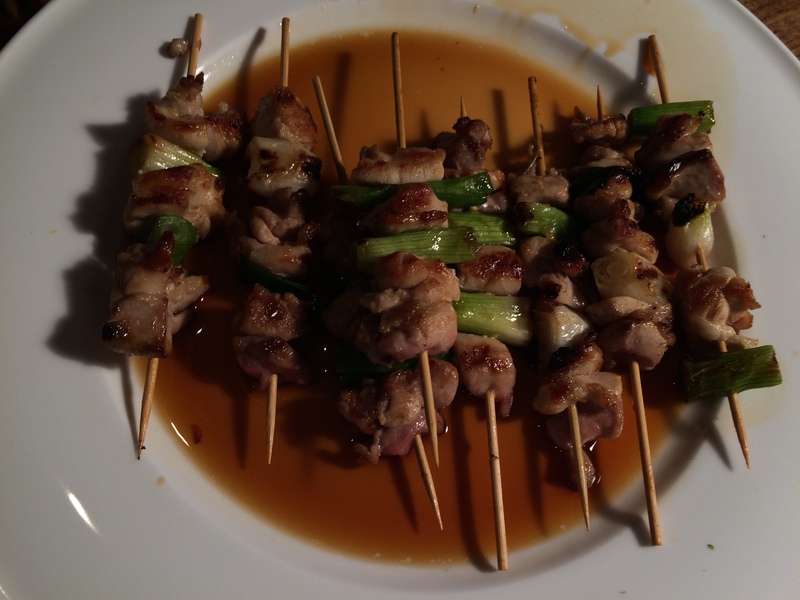 It had a gorgeous dressing made from sesame oil, soya sauce, and mirin. The salad tasted very fresh – slightly sweet, and very crunchy. 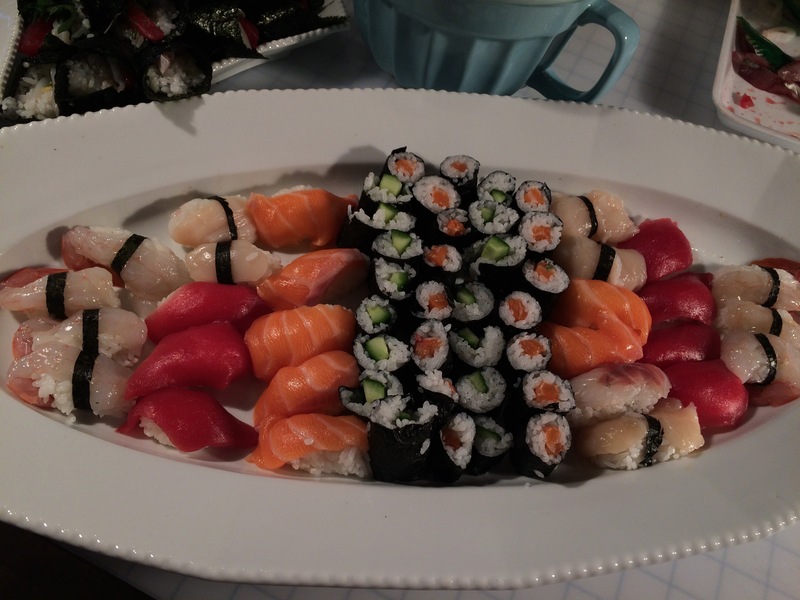 The key with sushi is not to use too much rice and to use big pieces of fresh fish to drape over the rice base. You have to make your hands damp but not too wet, and create a shaped piece of rice with a curved back. We put sea bream, tuna, salmon, raw prawn and scallops on to the rice, which we ate later with pickled ginger and soya sauce. To distinguish between two or three whitish fish Yuka showed us how to snip a ribbon on seaweed to wrap around the fish slices. 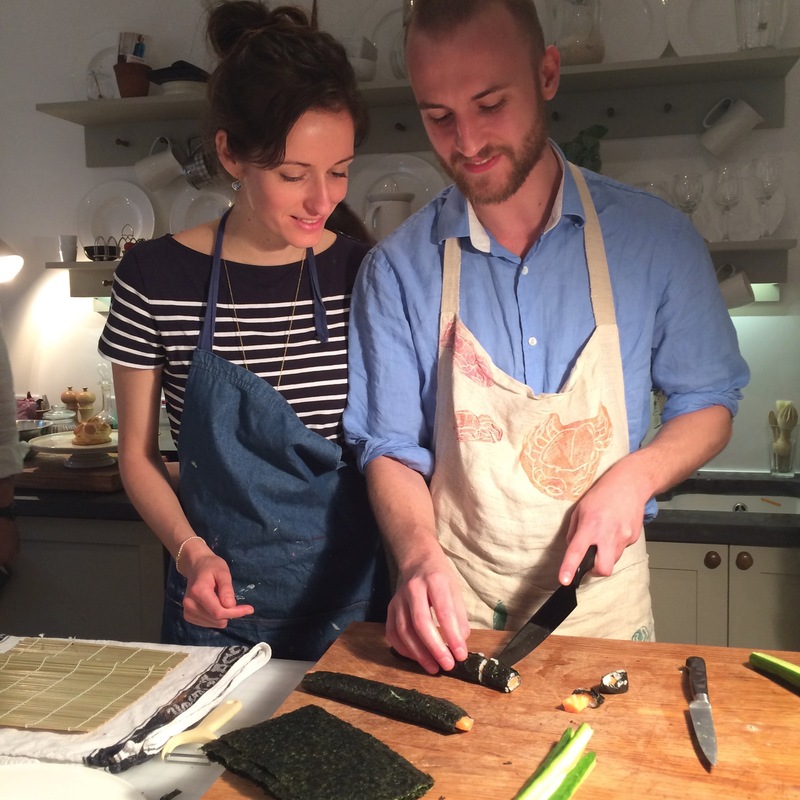 The Nigiri sushi was the most challenging as it has to be rolled with a bamboo mat. The sheet of Nori seaweed has a layer of rice (again, not too much rice) put on it, then a long piece of salmon or cucumber, before it is rolled up and sliced into four pieces with a sharp knife. We all found this fairly difficult, with the tall skinny people making tall skinny sushi, and the petite people making little neat pieces. Nick brought out his very special Japanese knife for the occasion (a kind gift from Batool). The hosomaki are hand wrapped cones containing raw squid, mackerel, salmon, spring onions, herbs, ginger, tuna or whatever you fancy. Here Meddie concentrates as she tries to get the sticky rice to adhere to the seaweed wrapper.The Nori seaweed is crisp and rather brittle before the rice is put on it. 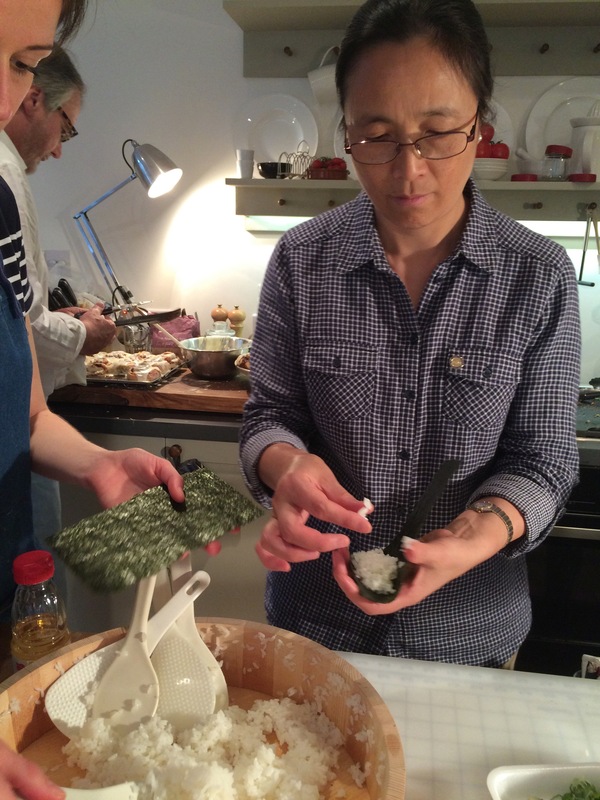 Some of the moisture comes out of the rice and the seaweed sheet softens. the background you can see Nick making faux Cinnabons which we ate as our pudding. Then after two hours we finally laid out all our work, (Meddie using up the last portion of rice with a final maki roll), surveyed it with great satisfaction and ate it all up. Well not all of it. Everyone went home with a selection of left overs, and a couple of Cinnabons for their tea. We were as stuffed as the Nigiri. 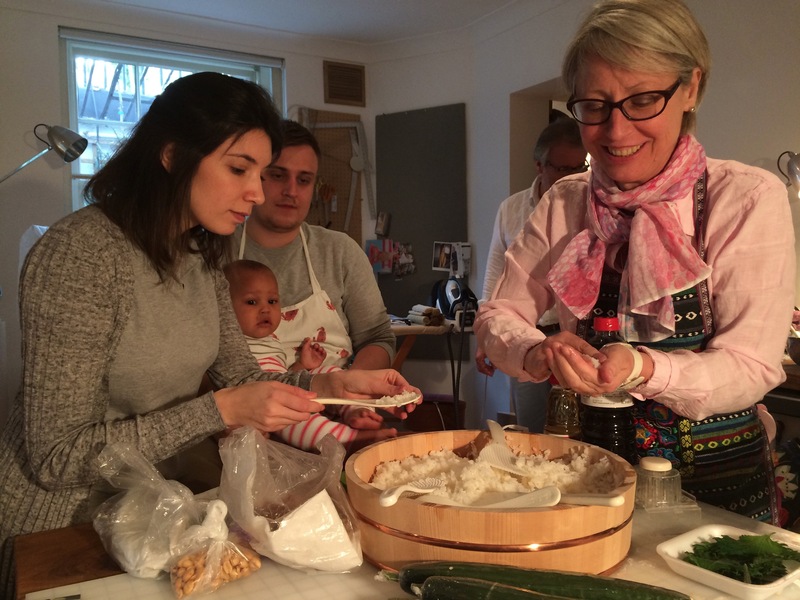 As an all-ages activity I cannot think of anything more fun than cooking a meal together. 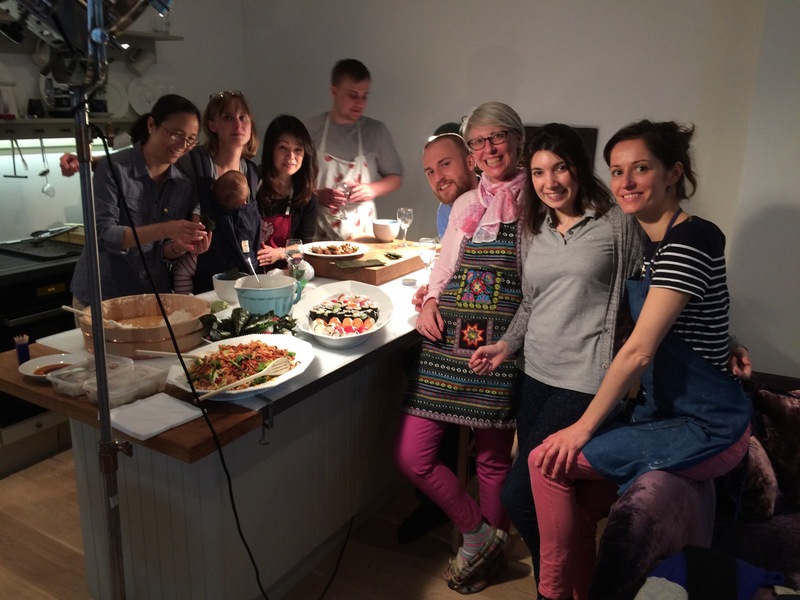 Yuka was great – she choose just the right dishes we could make in the time, she brought all the ingredients we needed and she distributed the work so all of us had a go at everything. We all learned some new skills, worked together as a team and enjoyed a very special meal. We are tempted to do it again with another cuisine. 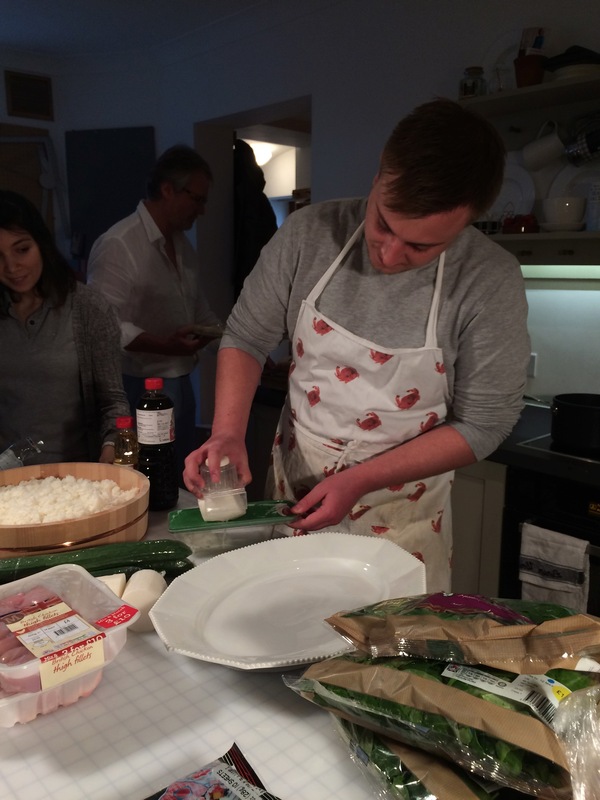 Meddie kindly offered to show us the basics of Chinese cookery. Of course you are right. The rice is key to getting the whole thing to work. Yuka brought a beautiful wooden bowl full of still warm rice for us to work with. It’s only morning and I am drooling over my keyboard!!!! !